Ramen noodles and pizza are quintessential staples of low budget college students and startup entrepreneurs alike. As fun as this rite of passage sounds, eating poorly affects your mood, energy level, and skinny jeans. Everyone knows they need to eat more vegetables, but yet many don’t consume enough in their daily diet. A common myth is that it’s difficult on a tight budget. Luckily, as someone with vegetable obsessive disorder, “VOD” I’ve figured out how to maximize the amount of greens in my shopping cart without spending more. In the bulk section, you can buy just the amount you need, instead of getting stuck with giant containers you’ll never use up, spoil, or get bored with. Dried is your friend! Chickpeas, green peas, lentils, brown rice and quinoa are just some of the items you’ll find. Plus, it’s an easy way to try new ingredients without committing to an entire bag! I know what you’re thinking, come on Sue, I don’t have time to wash my vegetables, particularly salad greens. But it doesn’t take much time, just wash it all at once, make sure you dry it thoroughly, and then portion it out to use later. Vegetables and fruit are at their peak of nutrients right after picking. Freezing preserves the good stuff like vitamins, beta carotene and more. It’s a great supplement to buying fresh, you can use what you need and put the rest back in the freezer, and they won’t go bad. Consider becoming a weekday vegan or vegetarian or just work on reducing the amount of meat you eat. Meat is expensive. There are lots of less pricey plant-based options (beans, lentils, tofu, tempeh) that you can experiment with. Eating less meat is budget-friendly, and more importantly it’s better for the environment. It’s tempting to buy what we want all year around, but remember that you’re paying for the plane ride those strawberries just took. Try picking up more of what’s in season instead. Soy powder, whey protein, vitamins and supplements, etc. can really add up. 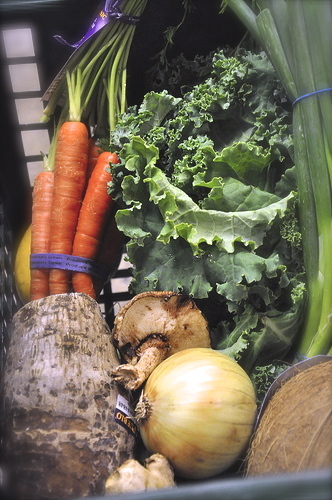 Get your nutrients directly from super foods like kale, chick peas, sweet potato, beets, legumes and taro root. More processing generally means more cost to you. And there is some evidence that your body absorbs more nutrients from whole food, rather than vitamins. Most stores have their own store brands that are more affordable than big brand names and often of equal quality. I buy the Whole Foods 365 brand of frozen kale, among others, on a regular basis. Make more when you cook or bake. You can store extras in the freezer for those long days after work when you don’t feel like cooking or keep one or two at work for lunch on days you forget to bring your meal. Seeds are not just for planting. Pumpkin, sesame, sunflower and flax seeds are all protein rich, great sources of healthy fat, and loaded with minerals and vitamins. They are more affordable and you can replace them for nuts. Right now, it’s definitely too pricey for me to buy everything organic and non-GMO, so I try to pick and choose what’s most important to me. Check the Dirty Dozen and the Clean 15 lists will tell you what foods have the most and the least amount of pesticide residues. Here’s to greener, less expensive shopping carts! Drop us a line. We’d love to hear how you’re getting more plant-based foods on your plate. Ask us questions about vegetables, food, or simply say hello.